The book demonstrates the hopeful stance the young take in response to ordinary suffering and significant trauma when adults talk with them about their losses. Its underlying themes convey the truth that loss and recovery are normal in the process of growing to maturity. It examines the strength of the child’s capacity for resilience through partnerships with adults who allow children to focus on the loss and tell the story of its meaning to someone who really hears it. The authors agree that adults need to perceive their own losses so that their attentiveness to the young is informed by wisdom that comes through self-understanding, but also agree that many adults do not offer that help to children because they believe it will make matters worse. The book reveals this fear as a false notion by dealing with childhood traumas such as acquired disability, warfare, HIV/AIDS, death of one’s parents and cultural dislocation. The authors are experienced practitioners who provide practical and theoretical insight into the dynamics of loss and recovery. The book offers hope for those who live and work with children and youth through its studied approach to addressing loss by describing young people’s potential to work towards wholeness even in the face of fundamental losses to their security. 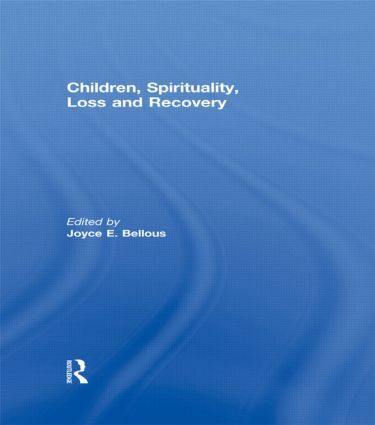 This book was published as a special issue of the International Journal of Children's Spirituality. Joyce Bellous is Associate Professor of Lay Empowerment and Discipleship at McMaster Divinity College, McMaster University in Hamilton, Ontario where she has taught since 1993. She researches and teaches in the areas of spirituality, postmodernism, multiculturalism, culture, ethics and education. She is a consultant, speaker and writer for teachers, pastors, colleagues and congregants on the subjects of leadership and ministry education. Her special interest is children and spirituality.